According to Texas' highest criminal court, obscuring any part of a vehicle's license plate, including portions of state name text and/or artwork, provides Johnny Law with all the cause he needs to pull over, ticket, and/or arrest the offending vehicle's driver. The 8-1 decision issued yesterday, concerning a case in which a man picked up a DUI bust after being pulled over due to plate obfuscation caused by a dealer-installed license plate frame, left three of the judges proclaiming the statute to be "uncommonly bad." Judge Cathy Cochran's advice to Texas drivers? 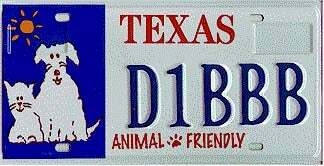 Spend a little extra money, if available, to get a personalized license plate without the doo-dad design details.